One of India's finest music composers and the torchbearer of the new generation Indian Music Scenario, Amit Trivedi is going to perform his first ever live in concert at Hyderabad on November 24th, 2018. He, along with his amazing team including the popular Jonita Gandhi, Divyaa Kumar and several others have joined together to enthrall the music lovers of Hyderabad with a unique and outstanding experience. 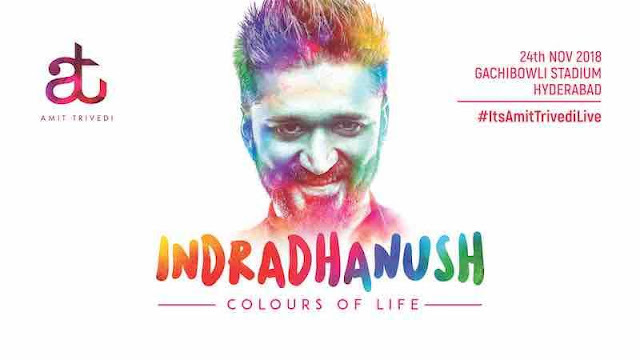 The concert is named as “Indra Dhanush - Amit Trivedi Live In Concert”, The Colours of Life, based on the concept of a rainbow, where each colour would be representing a mood and an emotion. They would be representing each colour to one aspect, like Nature, Womanhood, Love, etc and performing each song relevant to that. Also, Amit Trivedi is all set to launch a new technology of sound in the field of live shows for the first time in India. Started his career as a composer for Theatre, Jingles and Ad films, he debuted in Bollywood in 2008 with the movie Aamir, which was sort of a pathbreaking musical experience. He then joined hands with the maverick Anurag Kashyap for Dev D, whom he worked for many movies in the future and is a close associate of. Dev D introduced the world of Indian music to a genius called Amit Trivedi, who went on to win National Award for the same. He wrote amazing music for the musical hits like Udaan, Wake Up Sid, Aisha, Ishaqzaade, English Vinglish, Lootera, Love You Zindagi, Fitoor, Bombay Velvet, Udta Punjab, Manmarziyaan and many more. As a master music producer, arranger and singer, he did extraordinary work even in non film albums and live shows like MTV Unplugged, Coke Studio, Mirchi Music Awards, and multiple events. Amit Trivedi’s music has brought a new style of music to Indian cinema. A never before kind of experimentation in the style of arrangements and the genres but still holding a deep root to the culture of the music he is composing. His music takes one to a trance and overwhelms into the emotion of the track. There is never a miss of the melody, but there is no template of the music too. That zone, is only possible for a musical genius. With him debuting into Telugu music, after this long, with none other than Megastar Chiranjeevi's Magnum Opus “Sye Raa Narasimha Reddy”, it is a privilege for the audience here to experience his music. He is like none other. If there is One Ilayaraja in the previous generation, followed by A.R.Rahman, Amit Trivedi can be regarded as that one special talent. Welcome To Hyderabad, Mr. Amit.